This store is located on the arcade sidewalk called Ichiba Hondori in the commercial area called Ichiba (Market) in Naha City. This store has a history of 60 years in the confectionary industry, and it is deeply rooted in the locals’ life because it provides traditional confectionery for festive occasions as well as for religious rites. The store is currently managed by its founder’s young granddaughter. 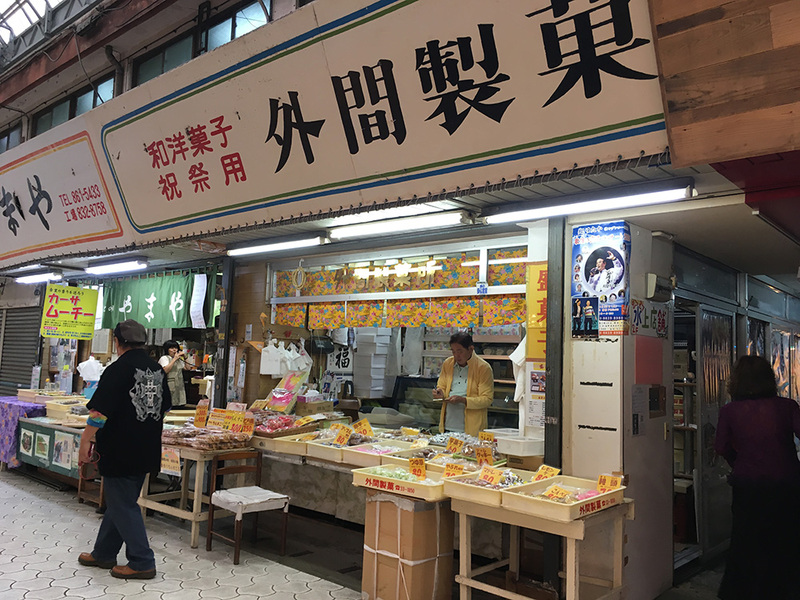 She decided to take on the family business to promote the Okinawan culture through the sale of the traditional confectionery since its consumption is closely related to cultural and traditional events. For example, sweets to be offered at a wedding, birthday, funeral, religious service, or other occasions are different in forms, colors, and sometimes in the ingredients to be used. There is a great variety of confectionery such as buns filled with red bean paste, or peanut paste, steamed buns filled with purple sweet potato paste, Chinsuko cookies, Okinawan style lemon cakes, and many other popular confectionery. The confectionery factory, where they make the sweets and continue to create new products, is located in Asato in Naha City. Three generations jointly work in harmony in this family business.